I’ve been writing a lot about food lately, so I thought I’d get back to the foundations of the Peaceful Weight Loss practice. Every day we return to the mat and again begin the process of finding ourselves. It begins by releasing tension from the body. Feeling our breath move easily into the abdomen. With each exhale we let go of a bit of anxiety and our peaceful nature begins to surface. Our practice continues with various poses designed to strengthen and stretch our muscles – allowing us to feel comfortable in our body, so it doesn’t distract us from our naturally occurring peaceful nature. We end in savasana – relaxation, further unraveling our tension and watching our mind and body slow down. Our practice supports our natural state. It reminds us that we are at our core stress-free. We see this by watching our thoughts and emotions pass in front of us as we move, breathe, and sit still. We become aware that these thoughts and feelings are not the entirety of who we are – there is something underneath these swirling thoughts and emotions that is calm, peaceful and present. That core of our being is not fat or thin, strong or weak, happy or depressed. That core is beyond these states and is always available to us. That self is the experience of peace. It can come at any time: while you are in triangle, eating the perfect piece of mango, or walking down the street. Our practice opens us up to experiencing this self. The more we taste it, the more aware we become of it. Non-beneficial behaviors begin to drop away. We are able to see clearly – to easily gravitate to useful, positive choices in our life. Food becomes nourishment for body, mind and spirit. Self-loathing and disappointment drop away as we see how beautiful our true self is. We become gentler towards others as we see that our core is similar, and possibly the same as theirs. We find love and acceptance in the present, and worry less about the future. Unneeded weight disappears as we let it go, by nourishing that self instead of obscuring it. 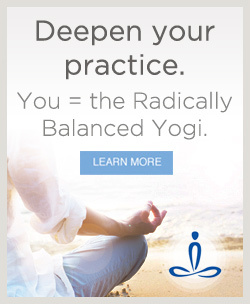 So enjoy your practice today – let that enjoyment radiate through your day and infuse your life. May we all be peaceful and happy.